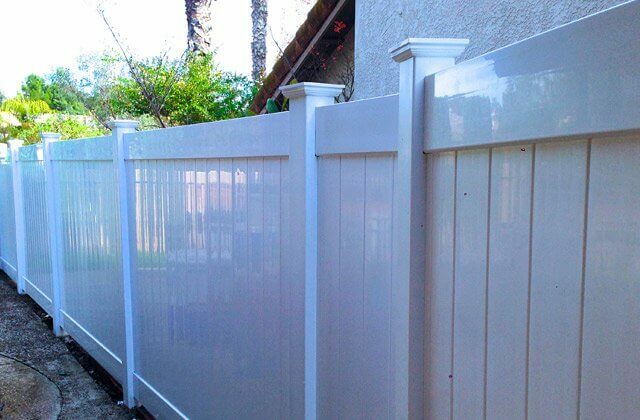 Palos Verdes home and business owners trust J&J Vinyl Fencing to provide them with exceptional quality vinyl and aluminum fencing design and installation services at affordable prices. 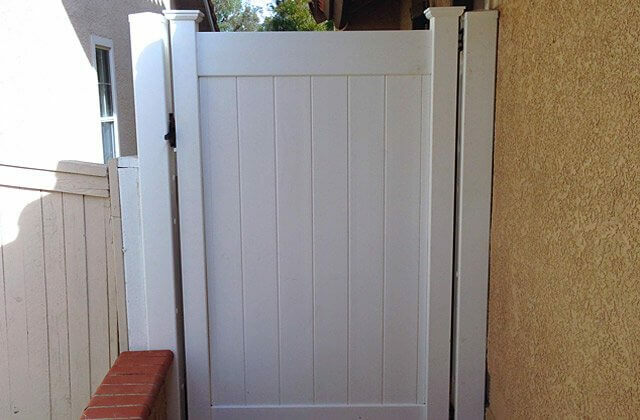 We are a family-owned and operated business founded in 1978, and since that time, we have provided our vinyl and aluminum fences and gates to thousands of satisfied clients throughout our South Bay and Los Angeles County service area. Our skilled fencing craftsmen are some of the most experienced in the industry, and each of our vinyl and aluminum fencing projects is personally supervised by our company's owner, from project inception through project completion. As an experienced fencing contractor, J&J Vinyl Fencing possesses the knowledge and expertise required to install a wide array of vinyl and aluminum fencing styles, from traditional to modern. Both vinyl and aluminum fencing serve as more durable alternatives to their wood and wrought iron fencing counterparts, and make a long lasting investment in your Palos Verdes residential or commercial property. Both types of fencing are virtually maintenance free, and will retain their like-new appearance for decades to come. 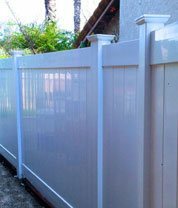 Depend upon the fencing experts at J&J Vinyl Fencing to install a vinyl or aluminum fencing system at your Palos Verdes home or business, and to do so at a very competitive price. Contact J&J Vinyl Fencing today from Palos Verdes. We offer our premium quality vinyl and aluminum fencing to the South Bay and all of Los Angeles County, and provide free estimates throughout our service area. J&J Vinyl Fencing is licensed, bonded, and insured. Vinyl fencing is a relatively new type of fencing, developed to serve as a more durable alternative to traditional wood fencing. Vinyl fencing has the look and design possibilities of wood fencing, but requires far less maintenance. 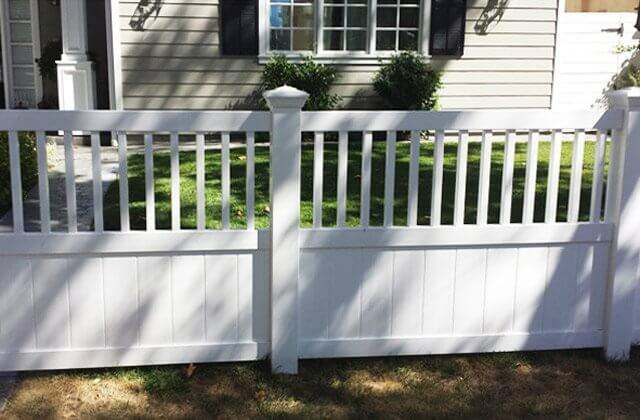 Unlike wood fencing, it will not crack, splinter, or warp, and does not require repainting and resealing. It will not succumb to dry rot or termite damage, but will maintain its like new appearance for years. Vinyl fencing will serve as a longterm investment in your Palos Verdes home or business property, providing your yard or grounds with a stylish hardscape accent which is both functional as well as beautiful. Aluminum fencing was created to serve as a more durable alternative to wrought iron fencing. 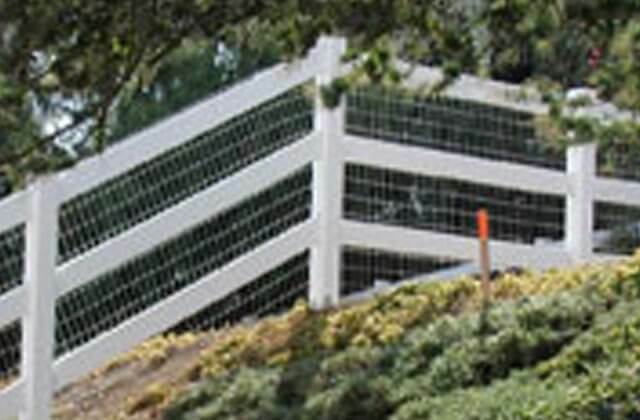 It is available to Palos Verdes in many of the same styles as iron fencing, but is far longer lasting. This is due to the fact that unlike iron, aluminum possesses a natural chemical resistance to rust and corrosion. For this reason, it does not require the constant maintenance that wrought iron fencing does. In contrast, iron is a ferric metal, and when it is exposed to oxygen and moisture, is susceptible to rust and corrosion damage. For this reason, it must be kept carefully painted or powdercoated at all times, because any nick or scratch in this protective coating can leave iron fencing vulnerable to the elements. Choose the aluminum fencing professionals at J&J Vinyl Fencing to design and install a beautiful, durable aluminum fencing system at your Palos Verdes home or business. Contact us today to schedule a free onsite estimate. Our business hours are Monday through Friday, 9:00 am to 5:00 pm, and on weekends by appointment. We accept all major credit cards, cash, and checks as payment, and are licensed, bonded, and insured. J&J Vinyl Fencing is Palos Verdes's trusted provider of privacy vinyl fencing. 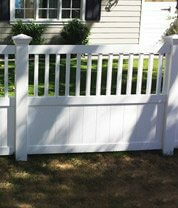 J&J Vinyl Fencing installs ActiveYards® vinyl fencing. ActiveYards® fencing features their patent pending GlideLock™ technology, a "click-and-lock" installation system which enables the construction of a vinyl fence with no gaps between the fence boards. This design allows for a truly private fencing system, as well as one which blocks airflow. Our privacy vinyl fencing is extremely strong, and able to stand up to high wind conditions. In addition, it is available in a choice of beautiful colors and designs, including styles featuring lattice panel and picket top details. 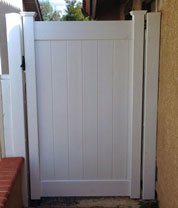 Entry and access gates provide both style and security to Palos Verdes homes and businesses. At J&J Vinyl Fencing, our vinyl and aluminum entry and access gates can be installed to operate manually, or can be motorized and equipped with the latest access control technology, for optimal convenience of access and maximum security. We are an authorized installer for the leading access control system brands, including DoorKing, Elite, and Viking, and can configure these systems to be operated in a variety of ways, including by keypad, remote transmitter, and smart device. 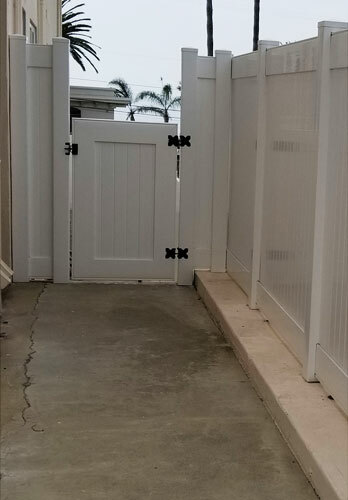 Contact us today to schedule a free onsite estimate on a vinyl or aluminum entry or access gate system for your Palos Verdes residential or commercial property. We offer a 10% discount to all new clients. J&J Vinyl Fencing is licensed, bonded, and insured. 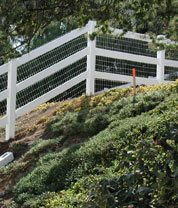 Depend upon J&J Vinyl Fencing for exceptional quality vinyl ranch rail fences in Palos Verdes at competitive prices. We offer a wide selection of ranch rail fence designs, and a choice of beautiful fence colors, including white, sand, wicker, and cambium cypress-which has the look and rustic appeal of natural cypress wood fencing. Yet unlike wood fencing, our vinyl fencing will not crack, splinter, or warp, and is not subject to the ravages of dry rot and termites. It retains its beautiful color and like-new appearance for decades, and is backed by a lifetime warranty. Contact us today to schedule a free design consultation and estimate in Palos Verdes. 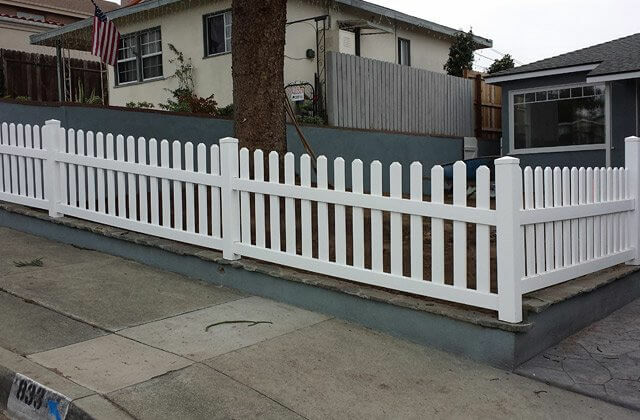 Vinyl picket fencing is available in the same traditional and contemporary designs as wood picket fencing, and is the perfect solution for Palos Verdes home and business owners who would like a durable, trouble free picket fencing system. At J&J Vinyl Fencing, our vinyl picket fencing possesses the look of real wood picket fencing, but none of the maintenance concerns. It will not crack, splinter, or warp over time, like wood picket fencing, and never needs painting or sealing. And since it is fabricated with SolarGuard™ sun protection, its beautiful color will never fade. Contact J&J Vinyl Fencing today, for premium quality vinyl and aluminum fences and gates at competitive prices. We back all of our vinyl and aluminum fencing installations with a lifetime warranty, and provide free onsite estimates throughout our South Bay and Los Angeles County service area. We have over 35 years of experience in the fencing industry, and offer all new clients a 10% discount on our fencing services. J&J Vinyl Fencing is Licensed, bonded, and insured. 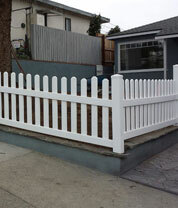 This 6 ft. tall vinyl fence installation was designed with a privacy gate in Palos Verdes, CA. The gate stands 4 feet tall and features contrasting black steel hardware.